The band have been out carolling on the streets of Freckleton and will be out again on Christmas Eve and Boxing Day morning with the final carol and jingle bells at The Coach and Horses from about 1pm. As the year draws to a close, the band would like to thank Kirby Mason Florists for loaning us a van to transport our equipment to the engagements, T R Snape Family Butchers for the famous tray of meat raffle prizes, all those in and around the village who have supported us, and to everyone who have come to see us play throughout the year. The band’s busy season is almost at an end for this year culminating in our sell-out Christmas Concert at the Lowther Pavilion in Lytham last weekend. The band and junior band enjoyed playing, and hope the audience liked it too! Thanks to Bob Gemmell for compering the concert for us and all the helpers who did great work behind the scenes to make it a success. The band have been out carolling on the streets of Freckleton and will be out again on Christmas Eve and Boxing Day with the final carol and jingle bells at Ponkies in the afternoon. As the year draws to a close, the band would like to thank Margaret Mason for loaning us a van to transport our equipment to the engagements, all those in and around the village who have given us raffle prizes and donations, everyone who has supported us on social media and everyone who has come to see us play. Charlotte and Anthony Roocroft looking a little damp! This weekend saw the band travel to Cheltenham to represent the North West in the 1st Section National Brass Band Championships. Having rehearsed in Evesham at lunchtime the band had to wait until nearly nine o’clock to play having drawn 17th and last – twenty bands had actually qualified, but three had withdrawn from the competition. The band’s performance had some fine playing, but the judges noted that the performance was inconsistent and as a result the band were placed a disappointing tenth. Paul and the band will learn from the experience as the band prepare for next season in the Championship Section. The band had a great weekend nonetheless staying at the quirky Evesham Hotel where the band enjoyed a friendly welcome and a pie supper after the rehearsal on Saturday night. The band would like to thank the hotel, and also the Avonbank (Evesham) Band for the use of their bandroom and nice brews. Thanks also to everyone who helped to organise the trip, especially Ian Threlfall our contest secretary and logistics expert! Thanks also to the friends and family who came to support us and for the overwhelming good wishes the band received via social media etc. The hard work has been done in the bandroom over the last few weeks on Kenneth Hesketh’s Alchymist’s Journal and the coach is booked for Saturday lunchtime to transport the band and supporters to Cheltenham Racecourse to compete in the National Championships 1st Section Final representing the North West of England. The band will be playing after 4pm in the Centaur Arena on Sunday depending on the draw out of a field of 17 bands. 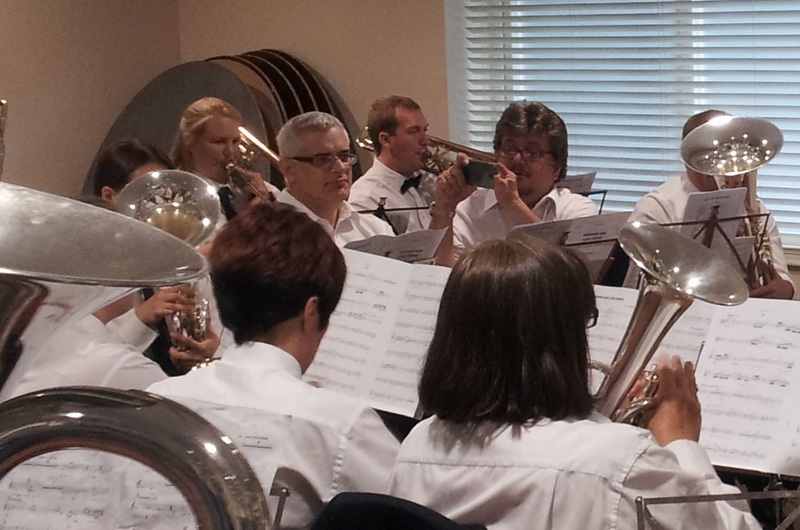 The band has been busy preparing for the The 94th Spring Brass Band Festival over the past few weeks. This year the band are taking part in the Senior Trophy contest playing Frank Wright’s classic arrangement of Hector Berlioz’s Les Francs Juges overture.The event will be the contest debut for Principal Cornet Player Dhani Miller. Details of the contest can be found here. Freckleton Band will be competing in the Championship Section next year, it has been confirmed. The band rejoins the top section after a few years competing in the 1st section and are looking forward to the challenge of competing against some of the best bands in the country. Here’s a few pictures from the mid 2000’s. If you have any photos of the band, why not send us a copy and we’ll put them on the website?